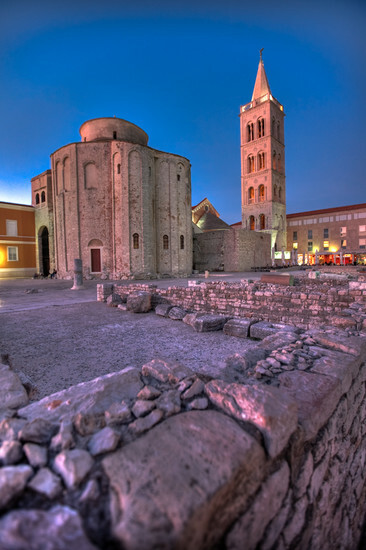 Zadar has a subtly different look to those of its Dalmatian neighbours. 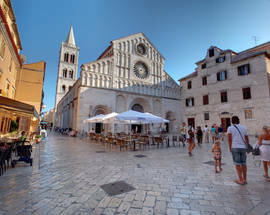 Although it is more ancient than Split, and just as rich in medieval heritage as Šibenik, central Zadar represents a far more complex meeting of old and new, with Roman-era fragments and Romanesque churches rubbing shoulders with blocks of flats, sleek cafés, and ultra-contemporary architectural installations such as the Sea Organ and the Greeting to the Sun. The reasons for this architectural mix-up rests largely on the fact that Zadar was subjected to serious bombing raids by the allies in World War II, leaving the huge kind of holes in the urban fabric of the Old Town that had to be filled by post-war planners. 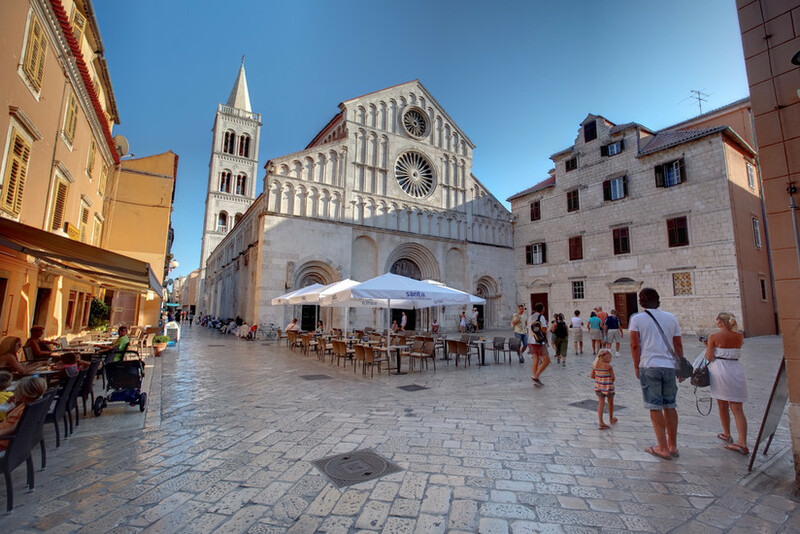 Of all Croatia’s Adriatic cities, Zadar was the one that suffered most in terms of destruction and depopulation during the war, and the generations that rebuilt the city in the Fifties and Sixties were genuine urban pioneers. Maybe it’s because of Zadar’s post-war experience of being a city on the architectural frontier that makes it such a forward-looking and innovative place today. 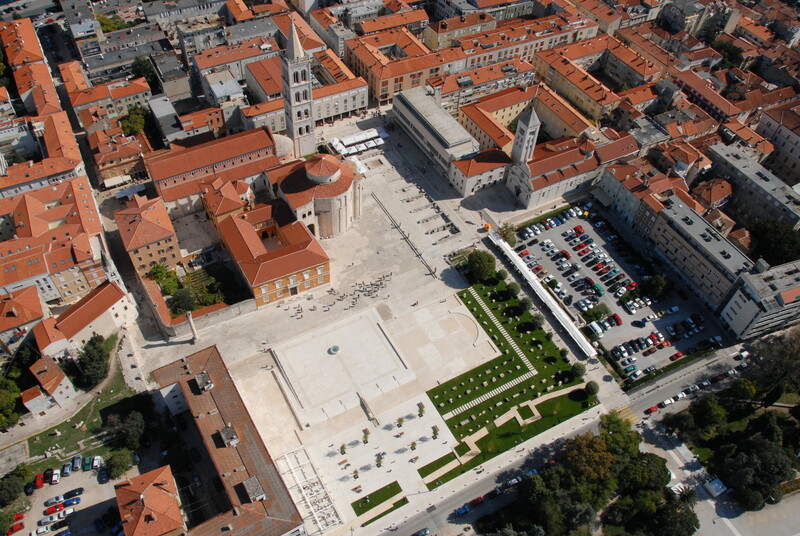 The rebuilding of Zadar was a major talking point for Croatia’s post-war rulers. 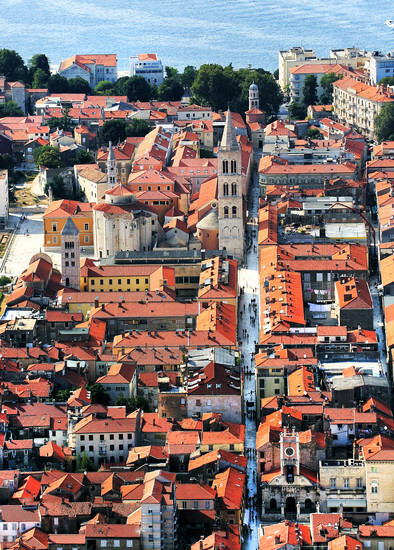 An initial plan put forward by architects Zenko Strižić and Božidar Rašica envisaged clearing much of the Old Town on the peninsula and building a modernist-inspired city in its place. However there was a competing desire among Croatian intellectuals to preserve as much of the city’s historical heritage as they could, and the radical plan was never enacted. 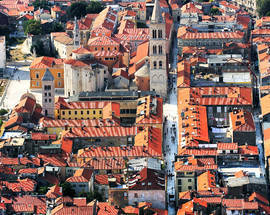 The urge to revitalize Zadar’s cultural inheritance was another important plank in the city’s post-war reconstruction. Writer and intellectual Miroslav Krleža was sent to Zadar in 1949 to oversee an exhibition entitled Gold and Silver of Zadar, based on the artistic treasures salvaged from the city’s churches. Not only did this exhibition lead to the establishment of the The Gold and Silver of Zadar museum that still exists in the city’s Benedictine Convent of St Mary’s, it also helped create a Croatia-wide wave of interest in Zadar, boosting the reconstructing city’s morale. It was Krleža that presided over the competition for a new urban plan. 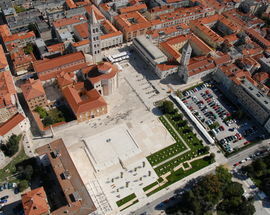 The winning proposal, by Bruno Milić, left more room for Zadar’s historic buildings, but again portrayed Zadar as a utopian city of the future, filled with rectangular blocks of concrete. Milić’s Zadar plan definitely caught the spirit of the age and was turned into an exhibition that toured Europe, visiting Paris, Milan, Moscow and London - before being shelved by the Croatian authorities as far too costly and ambitious. However the architectural visions of the Fifties, however over-optimistic, played a major part in determining contemporary Zadar’s appearance. Leading modernist architects were the ones who got the job of designing most of the new buldings. It was Rašica and Milić, for example, who built the boxes-on-stilts buildings that line Zadar’s main street, the Kalelarga. Of course a lot of people have felt over time that the buildings designed by Rašica and Milić were mistakes, concrete eyesores that took the heart and soul out of a historical city. However they were a logical response to Zadar’s wartime destruction, and nowadays have become classics in their own right. 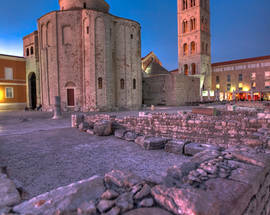 They also fit in rather well with Zadar’s current transformation into an innovative Adriatic city of the present day, a place in which a piece of centuries-old masonry can stand alongside a sound-and-light installation like Greeting to the Sun. The so-called Rašica building, the pale concrete slab that runs along one side of the Forum, looks just as serene and well-proportioned as its significantly older neighbours, especially now that the Forum area has been thoroughly renovated and re-landscaped by architect Ante Uglešić. Zadar’s Boutique Hostel, a modern-interior headline-grabber designed by Studio Up and Damir Gamulin Gamba, is an adaptation of one of Bruno Milić’s modernist blocks on the Kalelarga. An important aspect of the project was that Milić’s original façade had to remain unchanged. 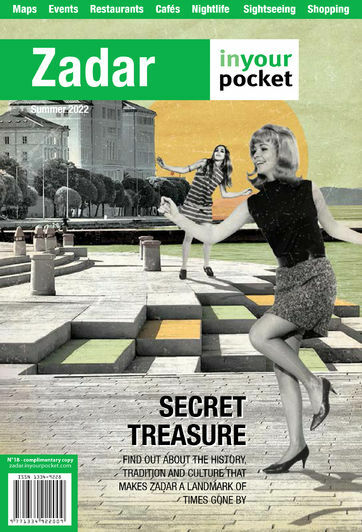 Incomplete and controversial though it is, the modernist projects of the Fifties and Sixties have had a profound effect on Zadar’s urban look. The upcoming projects of the future, such as the ambitious Gates of Zadar project entrusted to Sea-Organ author Nikola Bašić, can only be seen in the context of these earlier utopian predecessors.